A behind-the-scenes and previously unexhibited photograph of Elizabeth Taylor and Richard Burton at the beginning of their love affair is to be included in a new display of ten photographs by Michael Peto at the National Portrait Gallery, London in September, 2013. 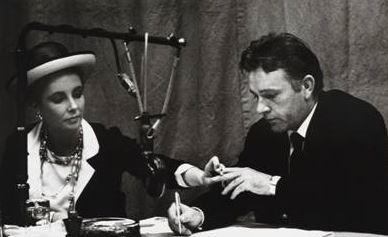 The photograph shows Elizabeth Taylor in a hat and necklace passing Burton a lit cigarette while the Welsh actor writes notes during the critically acclaimed BBC radio recording of Dylan Thomas’s Under Milk Wood in October 1963. The couple had met the previous year during the filming of Cleopatra, which was released in June 1963. Peto’s photograph depicts the couple before their first marriage in March 1964. The portrait is one of ten photographs by Michael Peto (1908-1970) taken in London during the 1950s and 1960s to go on display from 17 September 2013 at the National Portrait Gallery, London. Selected from The Peto Collection at the University of Dundee, the display will include photographs of famous figures such as Samuel Beckett photographed in his Paris apartment in 1961, Jennie Lee photographed near the Houses of Parliament in 1965, and Paul McCartney with The Beatles during the making of the Richard Lester directed film Help! (1965). One of Peto’s last sittings featured in the display shows a young Ian McKellen at the time of his success in the Prospect theatre production of Richard II in 1969.